Shine! 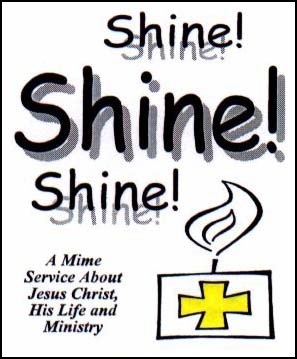 is a mime drama designed for Christian youth groups to present in church, on a mission trip, or as a community outreach. The drama is 50 minutes in length, and is based on 15 songs from the River of Mercy CD, which tells the story of Jesus’ message, ministry, death and resurrection. The drama is ideal for a clown ministry team to perform during Lent or as a special Easter event. The director’s booklet has everything you need to create an awesome mime drama service. It has instructions for the drama, make-up, costumes, face painting, lighting, stage setup, actions for all the scenes, plus Bible study discussion starters. A video of Shine! is also available to jump-start your production time. Christ calls the disciples, marking each one with a symbol of faith. This signifies how Christ has called us into fellowship and service. Christ leads the disciples in a fun line dance, teaching them to “do justice, love kindness, and walk humbly with their God” in this scene based on Micah 6:8. Christ instructs the disciples to share God’s love with the audience. They are encouraged to join in sharing the peace with each other. Christ is lifted up as the light of the world in this scene. The disciples light candles in the audience as the light spreads out everywhere. The closing song is a celebration of God’s power and faithfulness. The audience is moved to join in the celebration and fun! Face paint ideas and helpful hints for Shine! Choose a complete package or a single item from the menu below and select Add to Cart. $3.00 shipping will be added per line item for online orders. We ship via priority mail.